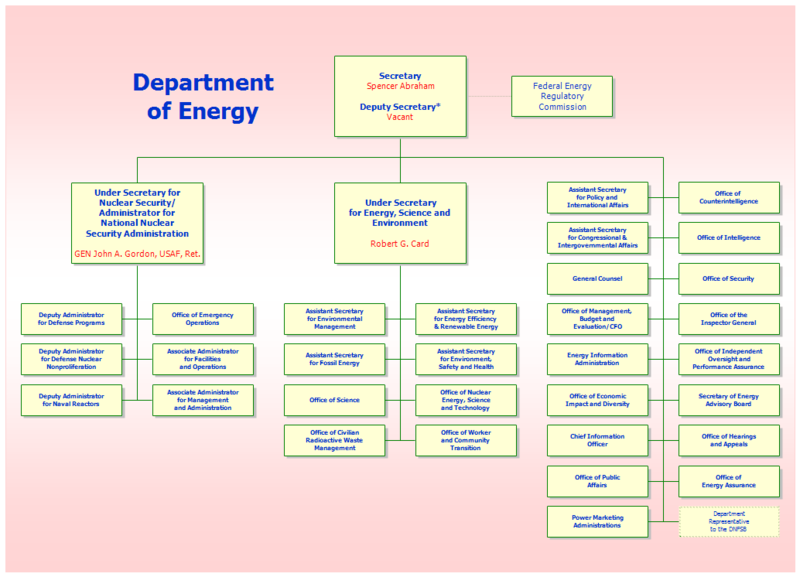 Description This chart shows the relationship between the Secretary of the Department of Energy, the Under Secretaries, and various departments. An organization chart or org chart is a diagram that shows the hierarchical structure of an organization. Usually a chart starts with a higher or superior level and branches downward to subordinate levels. An organizational chart of a company usually shows the managers and sub-workers who make up an organization. It also shows the relationships between the organization's staff members. Such charts are helpful to show a new employee where he fits in the organization. In many large companies the organization chart can be large and incredibly complicated and is therefore sometimes dissected into smaller charts for each individual department within the organization. RFFlow allows you to add hyperlinks so you can click on a shape and jump to another chart. Once RFFlow is installed, you can open the above chart in RFFlow by clicking on energy_orgchart.flo. From there you can zoom in, edit, and print this sample chart. It is often easier to modify an existing chart than to draw it from scratch. To draw this chart without downloading it, run RFFlow and click on the More Shapes button. Scroll to the Organization Charts stencil, click it, and then click the Add Stencil button.